Yoga Moments began in the small town of Witham in Essex. We run group Yoga classes and offer private Yoga tuition to individuals and organisations in Witham and towns located throughout Essex. Mine Hilmi teaches our Classes, she is a British Wheel of Yoga teacher with many years experience. The British Wheel of Yoga is the Sports Council England recognised governing body for yoga in the UK. We promote Safe Yoga and our Yoga Classes are suitable for all levels, from complete beginners to advanced yoga students. The environment is non-competitive and the atmosphere is always friendly and relaxed. We encourage women and men to attend our classes and ages range from very young to very old. 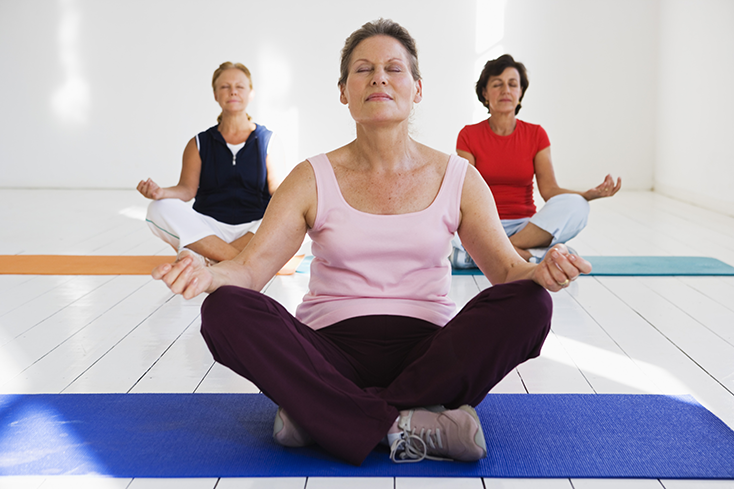 In fact, many students begin learning yoga after the age of retirement. Our students find that attending our Yoga classes can help with their physical and mental wellbeing, in addition to improving body strength, flexibility and breathing. Everyone can practice yoga and each student has a different motivation. Maybe you're just curious and would like to give yoga a try, or perhaps you have a condition that you believe could be improved by practising yoga. Whatever your motivation, we would love to hear from you, feel free to contact us by e-mail or if you would like to chat to Mine at Yoga Moments then please call here on: 07811 203 981. Also, feel free to browse the other web pages on our website, we have a page which explains more About Yoga and a page which outlines the benefits of yoga, as well as an FAQ's page which answers many of the frequently asked questions from new students that are curious about starting Yoga classes. The above image shows a student practising the Sukhasana pose (easy pose). This would normally take place at the begning of a class when we practice Pranayama (breathing practice) closing our eyes taking a hand mudra, letting thoughts in the busy mind pass through, trying to find inner stillness. The above image shows students practicing Balasana (childs pose). This pose can be taken at any time during the yoga class as a rest position, joining back in when it feels right for you. Balasana stretches the spine, hips, thighs and ankles in addition to relieving stress.